I'm beginning to think the control of light - both daylight and artificial - could be the single most important factor in museums and exhibitions. 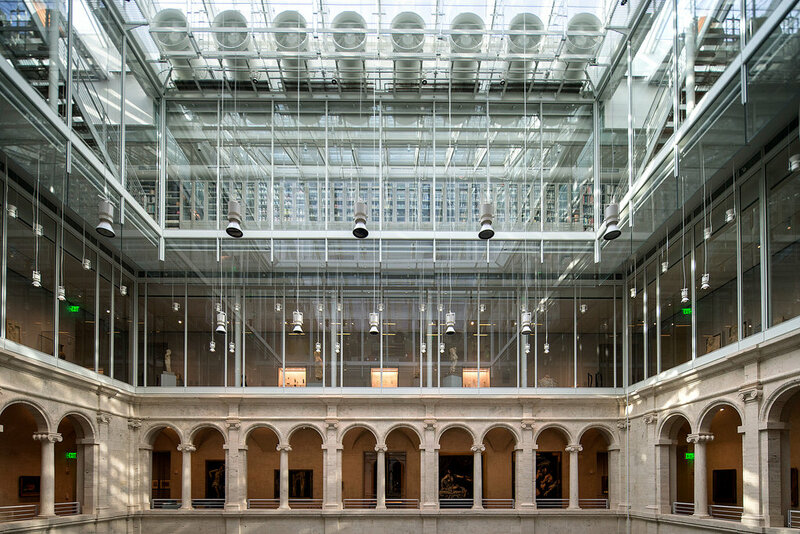 Having been so deeply affected by the beautiful artificial lighting at the Musee Guimet in Paris, I was bowled over by an entirely opposite experience in Renzo Pianoâ€™s reworking of the venerable Harvard Art Museums near Boston. The scheme has brought together three existing museum collections under one roof of the refurbished and extended 1927 Fogg Museum. The architectural context includes not only the Ivy League elegance of old Harvard but Le Corbusier's Carpenter Center as immediate neighbour and a James Stirling building as the former home of the Arthur M. Sackler Museum whose collections are now incorporated in the extended Fogg Museum. Piano has retained the Georgian Revival brick exterior and the Italian Renaissance-style interior courtyard but has quite literally lifted the lid on the whole structure and extended to the rear to create truly uplifting and largely daylit spaces. While appearing very natural and incidental, in fact the daylighting is of course highly controlled. Seeing artefacts in daylit spaces has the remarkable effect of making these pieces of sculpture seem somehow more accessible, less numinous than the beautiful depth of shadows of the Guimet. With the additional views and reflections of buildings outside the daylit art pieces look more like expressions of daily life. Of course thereâ€™s nothing new about glass and steel hi-tech extensions to existing historic museums but exactly how that glass and steel are interposed with the old stones is crucial to the museumâ€™s success as a venue for art and design. Piano expresses these new relationships with a glass seam which sews the new addition to the 1927 building,Â a seam which is both legible and open throughout the visit. The huge gesture of natural daylighting permeates the museum, draws visitors through spaces and up towards the upper floors. This permeability between street, inner courtyard and display gallery is matched by an openness and permeability in the museum's working spaces. Below, a cabinet of pigments used by conservators is on display from the Lightbox Gallery and elsewhere visitors can see conservation work going on through generous windows and programmed events. Iâ€™ve discussed in previous blogs how often museum design is at odds with the design of the content on display. But my feeling at the Harvard Art Museums is that Piano and local architects Payette have succeeded in creating a truly holistic design where building and content speak in interesting and varied dialogues, all moving toward the same end: the appreciation of form, whether urban, architectural, sculptural or painterly.